This LP has 57 parts. For those unfamiliar with the series, Fire Emblem games are fantasy turn based strategy games with many RPG elements, including persistent units with often deep and rich characterization who level up as you use them. Separating Fire Emblem games from, say, Shining Force or Final Fantasy Tactics is that character death in Fire Emblem is permanent. If you let one of your soldiers die, you must either restart that chapter of the game or continue the rest of the story without them. If your main character (The "Lord") dies, you lose and must restart the chapter. Notably, Fire Emblem games are almost completely standalone and set in different universes from each other (with a few exceptions). You do not need to know anything about the other games in the series to appreciate the story of this one or to understand its gameplay mechanics. This GBA game goes by many names. Officially it was simply called Fire Emblem in the U.S., since none of the Fire Emblem games made in the previous 13 years had been released here. In Japan it was subtitled Rekka no Ken, usually translated as Blazing Sword. Most U.S. series fans, including myself, will call it Fire Emblem 7 since it's the 7th in the series overall. Debates as to which of the (up till now) 13 Fire Emblem games is best can be quite heated, but 7 is usually considered one of the greatest. Having played nearly all of the FE games, I regard this one as not only the best but quite possibly the only truly great game in the series. It is not the most challenging for a veteran gamer (That would be the near-legendary Fire Emblem: Thracia 776) or the prettiest (Probably Path of Radiance for the Gamecube), but it has a good balance of wonderful story, great music, atmospheric art impressive for the GBA, solid gameplay, tremendous replay value, a wide range of available difficulty, and perhaps the deepest and most appealing characters in the series. Along with Les Miserables, it's the only work of art of any kind that I would describe as 'moving'. That is why I think it's worthy of another Let's Play. There are many good LPs of this game, but relatively few of Hector Hard Mode (the hardest difficulty mode available), and fewer yet of a Hector Hard Mode Max Ranking run. To explain those terms for the unfamiliar: Hector Mode refers to the unlockable version of the main FE7 story that is told from the point of view of Hector, one of the protagonists. Hector Mode is generally more difficult than the main mode (Eliwood Mode) and also has some additional content (New conversations and character development, new chapters, more secrets available). Hector Hard Mode is exactly what it sounds like: the much more difficult version of Hector Mode. Enemies will be significantly stronger and more numerous, allies will gain levels more slowly, and treasures will often be harder to acquire. Additionally, your performance in the game is scored with a ranking system based on how quickly you complete the levels, how much gold and riches you acquire, how much experience your characters get, how many survive, and how many attacks it takes you to kill your enemies on average. To achieve the maximum possible ranking on Hector Hard Mode is one of the greatest challenges in the game. I intend for this LP to be part guide to HHM Ranking runs for those who haven't yet done one and part exploration of why and how this particular FE game is so successful in telling the story of its characters and providing a fun experience for the player. 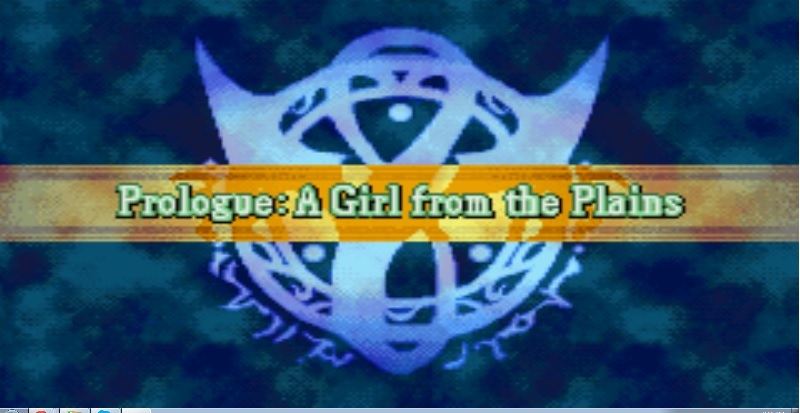 I will not be posting the entire script of the game here since that's available on something like half a dozen Fire Emblem fan sites (along with all sorts of extra scenes I won't be able to get because I'm doing an HHM Ranking run). What I will do is summarize the story, show you some of its particular highlights, talk about the ways it's told well and the ways it isn't, and outline my strategy for tackling this challenge as I go through it. There will be some fairly significant spoilers in this LP and the game has been out long enough that I doubt many people will mind you spoiling parts of it for them. Still, be polite to anyone here who hasn't played the game and don't reveal too much to them before I get to that part of the game. That probably includes talking about FE6 and its events in any way. I've done HHM Max Ranking runs before, so telling me that using X character or doing Y thing is a bad idea is unlikely to sway me. As characters are introduced, I'll talk about them as units as well as as people and that will also generally include my analysis of how useful they are. Don't be offended if I say I don't intend to use your favorite character. Still, I'm always refining my strategies and open to suggestions and discussion. As a wise man named Canas once said, "Teaching illuminates the minds of both master and student." 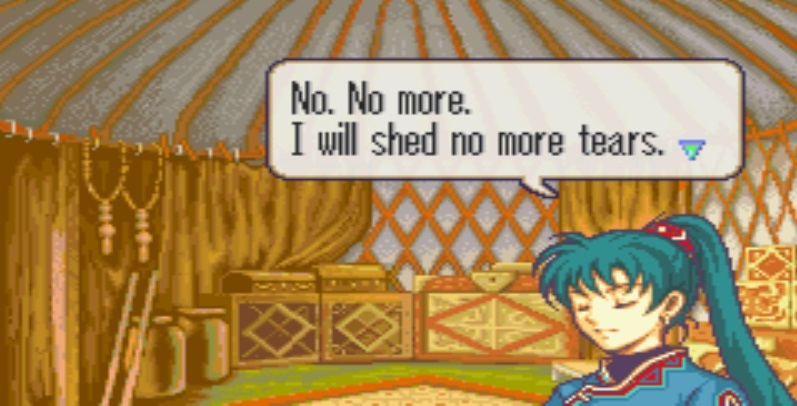 Before Hector's story begins, one typically plays through "Lyn's Story". Lyn's story is essentially a long prologue and tutorial meant to introduce players to the setting, characters, and mechanics of the game. As a tutorial, it's extremely easy to complete. However, I won't skip over it since it contains important story details and is a very important part of preparing for an HHM ranking run. More on that later. Without further ado, let the Let's Play begin! 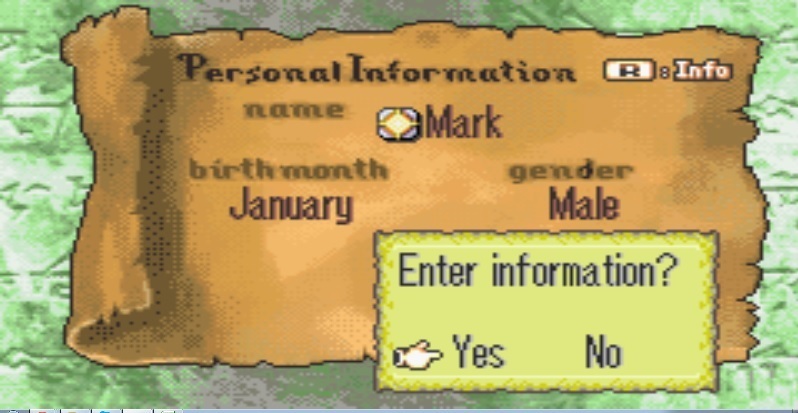 One unusual feature of FE7 is the presence of a Tactician character, with the default name of Mark. The tactician doesn't take part in battle, is never seen talking, and generally serves as a stand in for the player. 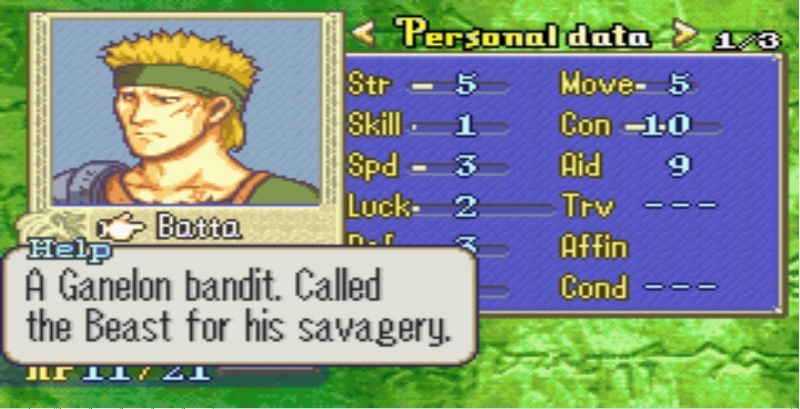 Some critics of FE7 say this character adds nothing to the game and puts needless distance between the player and the game universe. However, I would argue that the tactician does have enough of an implied personality from the other characters' reactions to be interesting and his/her presence makes certain conversations among other characters make more sense (Some examples will be mentioned as they appear). Could they have done without the tactician? Yes. Would eliminating the tactician make for an unambiguously better game? I don't think so; there would be both advantages and disadvantages. For one thing, you'd lose the minor changes that the customizable tactician makes possible. 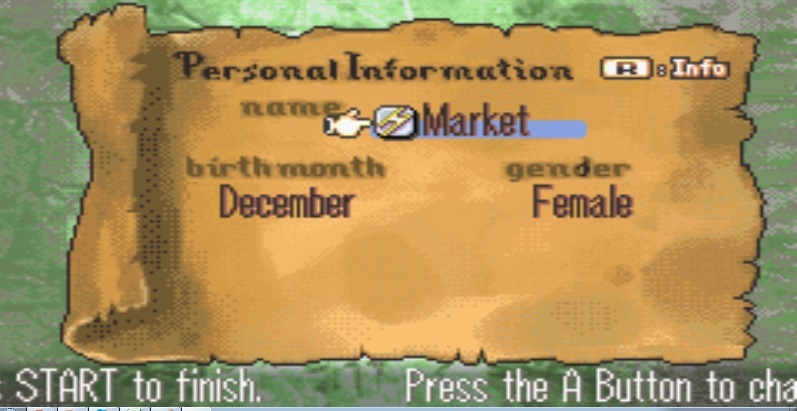 You can change the name, gender, and birthdate of the character. Some characters react differently to a male than a female tactician and have slightly different dialogue as a result, which helps deepen your understanding of those characters. Furthermore, the tactician's birth month changes the tactician's elemental affinity (here affinity is Thunder as evidenced by the bolt, by default you can see it's Light). This grants small hit and dodge chance bonuses to characters with the same affinity. While this has only a small effect on gameplay, it's not nothing. In my opinion, they should have expanded the role and customizability of the tactician to be more interesting rather than eliminating it. I'll make the tactician female because I'm less familiar with the dialogue for that case and will set the tactician's affinity to Thunder because that will boost several units I'll be using who need all the hit and dodge bonuses they can get. And at last the game begins! 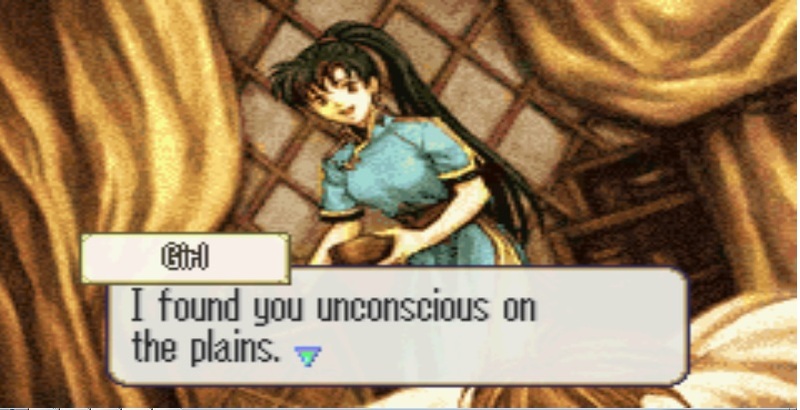 Lyn (a young swordswoman living alone on the great Sacae plains) takes in a young woman (the tactician, here named Market) who she found unconscious outside. The two of them deal with a few bandit raiders led by Batta the Beast and then resolve to travel together to hone their skills. Neither of them has a home to leave behind since Market is already a wanderer and Lyn lost her family and her tribe to a brutal bandit attack some months ago. The game immediately hits you with some of its very pretty and atmospheric music. The soundtrack is quite excellent and rather evocative and it adds greatly to one's appreciation of the characters and what they're feeling as one plays. While not as fancy as the cutscenes in later installments of the series, portraits and pictures like these are quite well done and have a lot of personality. I'd argue that much of that is lost in the animated cinematics of a game like Fire Emblem: Awakening or Radiant Dawn. Here's the map for this level. For the benefit of newcomers, I've selected Lyn so that you can see her movement range in blue. Red squares are those she can't move into but can attack into. 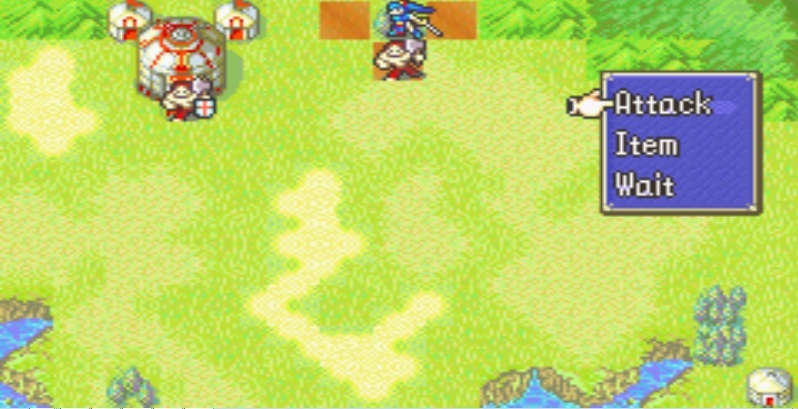 The two red guys with axes are the enemy, each is of the lowly Brigand class. The main character of the first 10 or so chapters of the game, appropriately dubbed "Lyn's Story". Lyn is a young, inexperienced swordswoman living alone on the vast Sacae plains. She's grieving for the loss of her family and her tribe as the story begins and intends to serve their killers up a nice, cold dish of sweet revengeance in the near future. However, her life takes an unexpected turn when she meets the tactician. We soon see that though she's violent and merciless, she's also compassionate and devoted with her small circle of friends and family. She gets some of the most development of any character in the story, partly because she has the first third or so of the game in the spotlight and also because her story is woven closely with that of Eliwood and Hector later on. Lyn is one of the more interesting and appealing characters in the game. She's not as unimpeachably heroic as the soft-hearted Eliwood, but she has a strong sense of justice and duty to friends and family. And she's perhaps the most competent of the 3 lords with her combination of patience, practical skills, combat prowess, and iron will. These (plus a magic sword) will serve her in good stead. 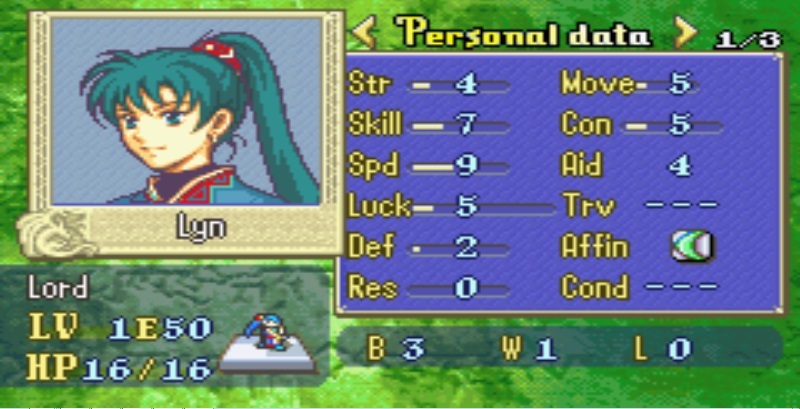 Statistically, Lyn is good but not great. She has tremendous Speed and good luck so she can dodge well, but she lacks the HP or defense to take the heat on the front lines for long anyway. Offensively she's also rather lacking because her Strength is poor and she can only use Swords, a rather weak category of weapon, for most of the game. Her greatest asset is actually her special weapon, the Mani Katti, soon to be revealed. This is an EXTREMELY useful sword while it lasts. Her greatest weakness is that promoting her (and thus making her viable in the endgame) costs double price. She's not worth that, so I will not be promoting her. Still, I need to use her a decent amount just because she's required to bring along on many chapters and because she must be high level for me to unlock one of the chapters I want later on. The top left of those red guys is the chapter boss, Batta the Beast. He's not much of a threat except that he's sitting on a Gate (powerful defensive terrain). You can see his stats here; they're pretty feeble. More interesting is the brief note about who the character is. Most FE titles do not have little notes like these, and I regard that as a big loss. Batta may be a very minor character, but he's not completely faceless this way. Most later FE7 bosses get a decent amount of character development through their pre-level dialogue as well as additional information in these notes. 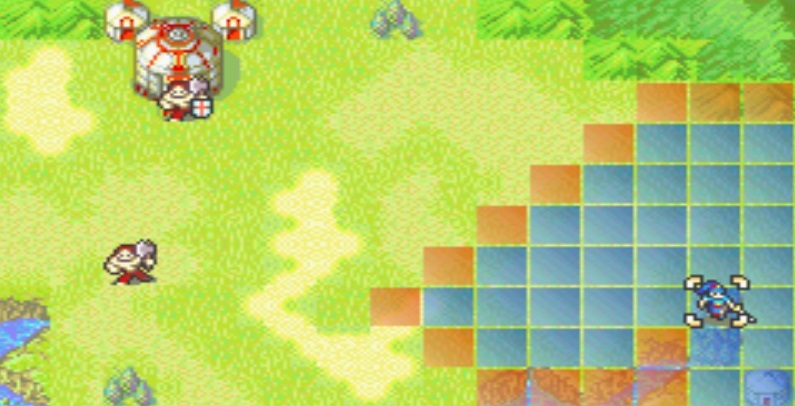 Batta is as faceless as enemies get in this game, but we still know more about him than about many bosses in, say, FE9. This chapter is trivially easy if played smart. I'm going to take my time so that I don't need to use any Vulneraries (healing potions). To that end, I moved Lyn way up to some protective Forest terrain at the top of the map and engaged the brigand there where he can't hurt Lyn. Outstanding! Though an increase in Strength would have been nice, it's very rare for her to gain any Def, let alone this many stats at once, so I'll count my blessings. Most characters in this game can gain a total of 38 or so level-ups (going to level 20, promoting to level 1 of a better class, then going to 20 again) and at each level they have a fixed and character-specific chance of gaining +1 to each stat. You'll notice that in a single level up her Def went from 2 to 3, a 50% increase, and many of her other stats improved by a significant % as well. The amount of growth you can get from level ups often dwarfs your starting stats, so high level characters are often dozens or hundreds of times stronger than low level characters. With Batta dead, Lyn takes the gate he was standing on and the chapter concludes. The next day, she and Market talk about their plans for the future and decide to set out together. 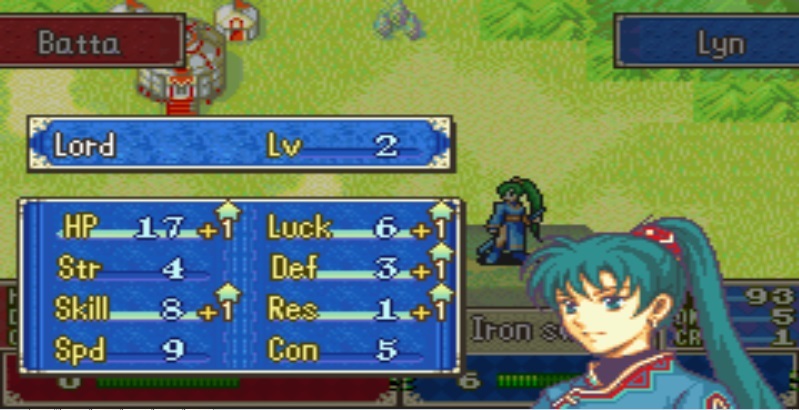 The Tactician unwittingly rubs some salt in the wound of Lyn recently losing her family. Listening to the music during this scene is required to fully appreciate it, so there's no substitute for actually playing this game, but I'll have other opportunities to bring up this point again later. And that concludes the prologue! I shall move forward at a faster pace from now on.